An Udderly Fabulous Afternoon at Fair Oaks Farm | Bloom. So, was anyone else struggling yesterday? Both were beautiful and a lot of fun, but we both thought it was pretty weird to go stag after all these years of weddings with a permanent dance partner. We were together at a wedding just a couple weeks ago near Chicago. It was a beautiful Roman Catholic Mass full of neat traditions, not to mention a rocking reception where we were able to catch up with a lot of Adam’s fraternity brothers and their wives. As we headed home down I-65 on Sunday, I commented on all the billboards for Fair Oaks Farms, a relatively big dairy just off the interstate. I have driven back and forth on 65 for years going from Indy to Chicago for work and visiting friends, but had never stopped. Adam had been a couple times when he was younger and suggested that we stop. With nothing better than laundry to do at home, I happily agreed. … Plus, one of the billboards said they had ice cream. It’s hard to say “no thanks” to ice cream. We parked and walked into the building built like a huge barn. Inside, we paid and the staff member told us the tour would begin in about twenty minutes. In the mean time we looked at all sorts of exhibits with facts about the farm and cows. 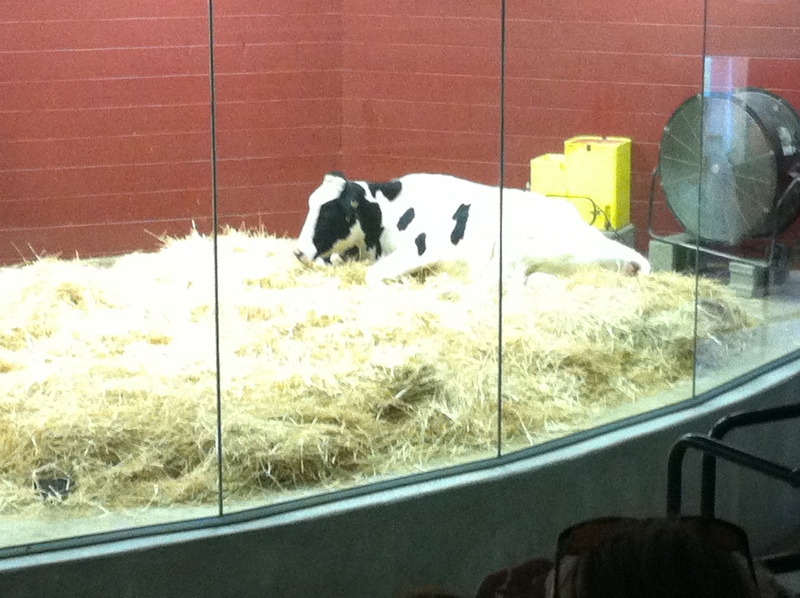 This is where I began to learn that I knew absolutely nothing about cows. My first lesson in Cow 101? Females are called Heifers. Which, I just thought was what just a cow in general was called. Not to mention, quite an unlady-like nickname. Soon we hopped on to a big cow print bus (Seriously. Cow Print. Awesome.) and headed to the cow stalls. They are at a separate destination for the sake of sanitation. 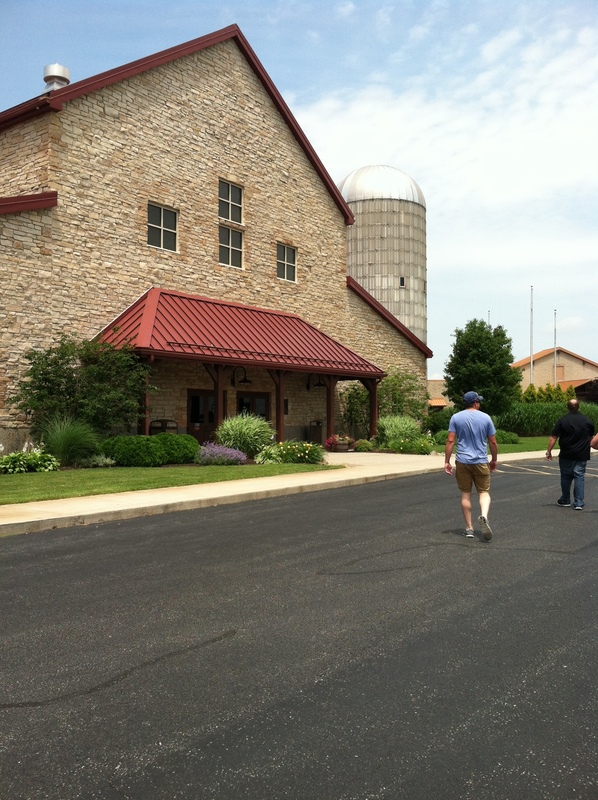 The property is 19,000 acres and began in 1998 thanks to a few dairy farmer families. The bus ride had a recording playing with information about what we were looking at. 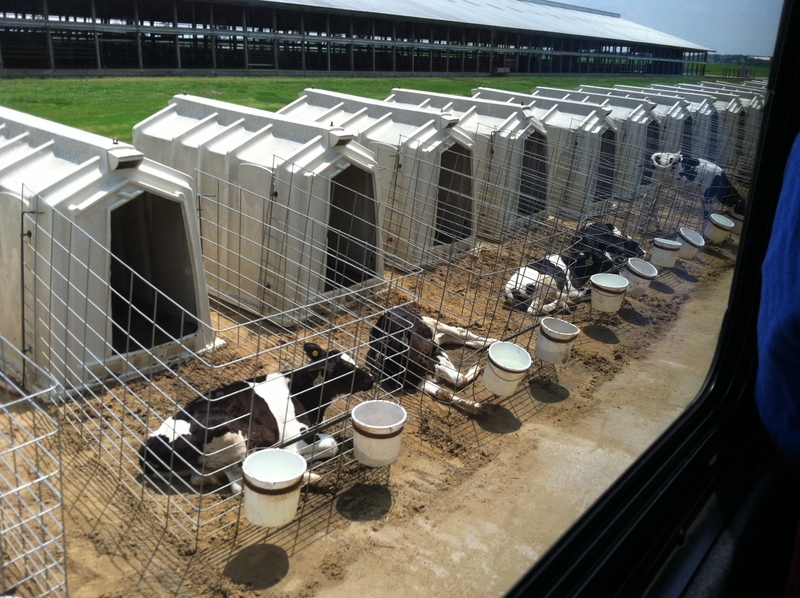 The recording drove home their concept of “Cow Comfort.” The stalls are cleaned three times a day. They maintain a seven mile per hour breeze and there are heaters in the winter. They also have veterinarians and animal scientists on staff to make sure the cows are healthy. Calf’s in their pens. They will move into the larger stalls once they are larger. What we saw next blew my mind. The bus stopped and we headed up a flight of stairs to an observation deck. 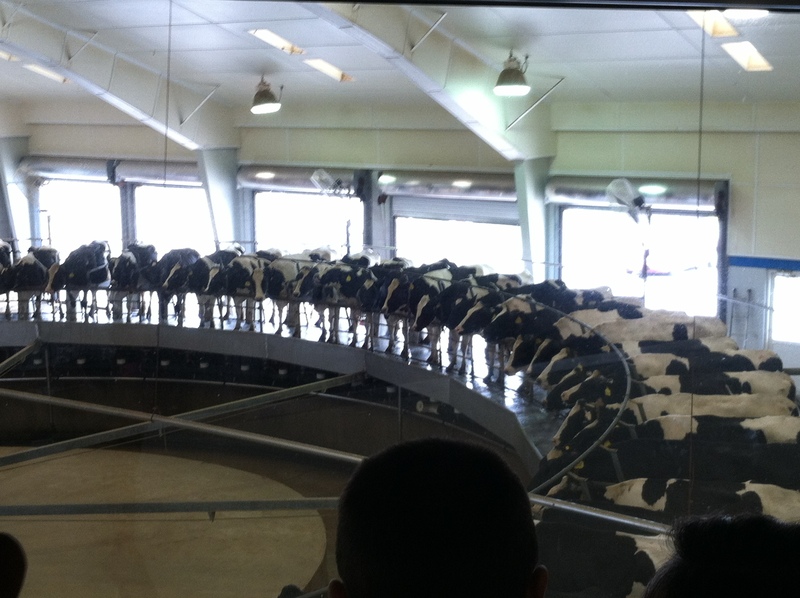 We were overlooking the machine that milks all the cows. The machine was similar to a carrousel as it spun in a slow circle. The cows were getting on and off this carrousel on their own. The guide mentioned that the cows are creatures of habit so they know exactly how to get off the carrousel and want to get on because they want to get milked. Each cow is milked three times a day and they only take five minutes to milk. The machine runs for nearly twenty four hours a day. The guide said that it takes seven hours to milk the whole heard. The hour after the milking is used to clean and sanitize the machine. Fair Oaks Farms produces 25,000 gallons of milk each day and nearly 99% of it is sold to a major grocery chain in Indiana. The farm obviously also produces a lot of manure, but it’s used to benefit the farm too. The cows waste is turned into energy that powers the whole operation. It’s equivalent to the power needed for 750 homes. The bus took us back to the attraction area we did a little more exploring. There were a lot of fun rides for young kids, an awesome garden that Adam and I “ohh-ed” and “ahh-ed” over, and even a room where you can see a cow have a calf. There are eighty calf’s born a day! It was really neat to see. A cow tending to it’s just born calf. The awesome garden and grounds at Fair Oaks. Next it was onto the cheese. I think if I was asked to select one food that I had to eat everyday for the rest of my life, it would be cheese. I love it. Any kind. Plain, on a sandwich, in a salad, with wine, paired with crackers. It doesn’t matter. Adam picked up some dill flavored cheese cubes and I choose a wedge of aged gouda. 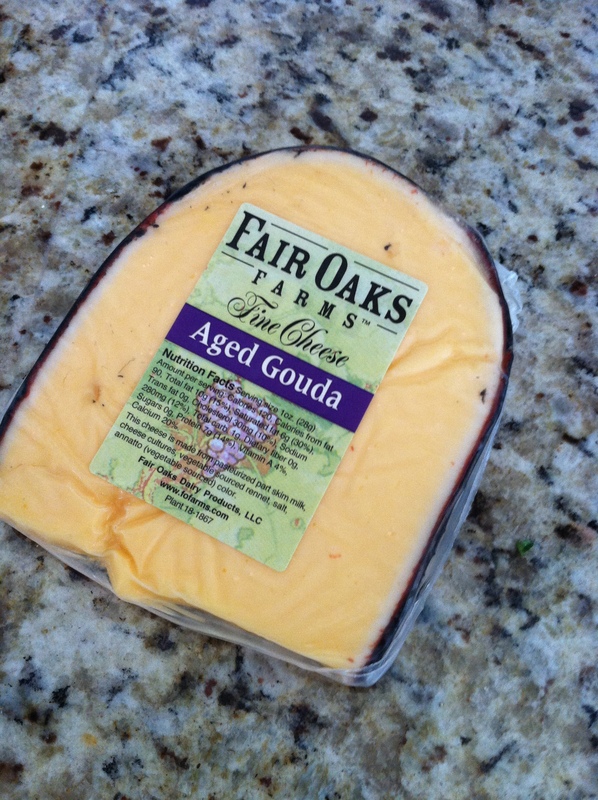 The gouda made for a great little appetizer a few nights the following week. I loved it’s creamy, slightly salty texture. 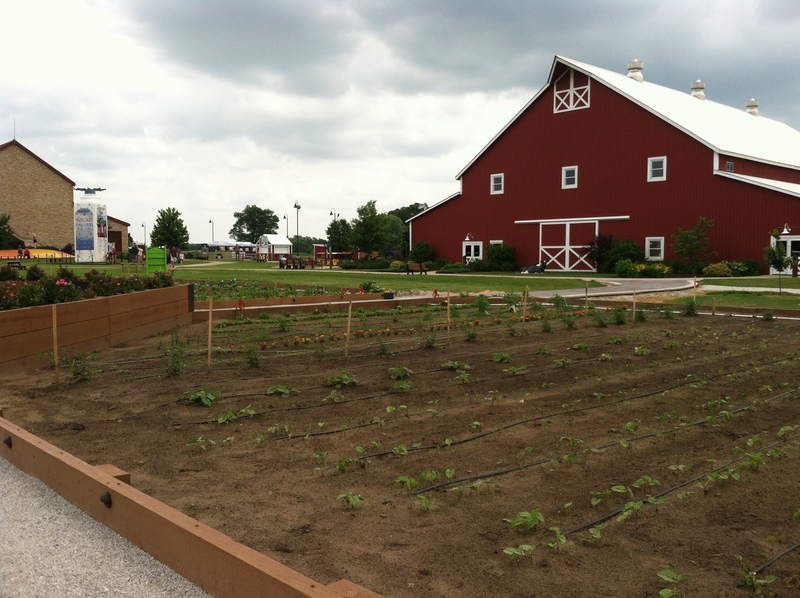 I really enjoyed our agroturism adventure at Fair Oaks and would love to go back, especially with children. There was so much to learn and lots of interactive activities for little ones. I also loved to see how much care was given to the cows. They have taken great steps to make sure the animals are comfortable and treated well. … I will also be much more apt to stop there now that I know how fabulous the café is. 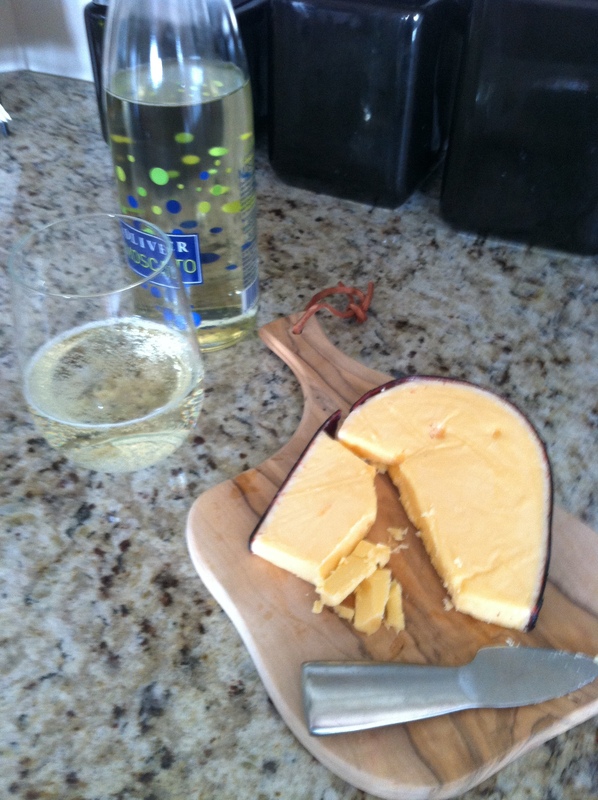 The gouda back at home with some moscato from an Indiana winery. Make sure you have a little time. The tour is about forty minutes and there is a lot to see. It’s not a place you want to be if you’re in a rush. If you are in the area and have kids or are a teacher, look into the field trips offered. They have a “Pig Adventure” opening in August! They will have a similar tour, just with pigs. Wonder if this means there will be bacon in the café? Mmm… bacon. your blog and may come back in the future. I want to encourage you to continue your great job, have a nice evening!